Create delicious crispy fried foods with the help of this 7 qt. aluminum fryer pot! 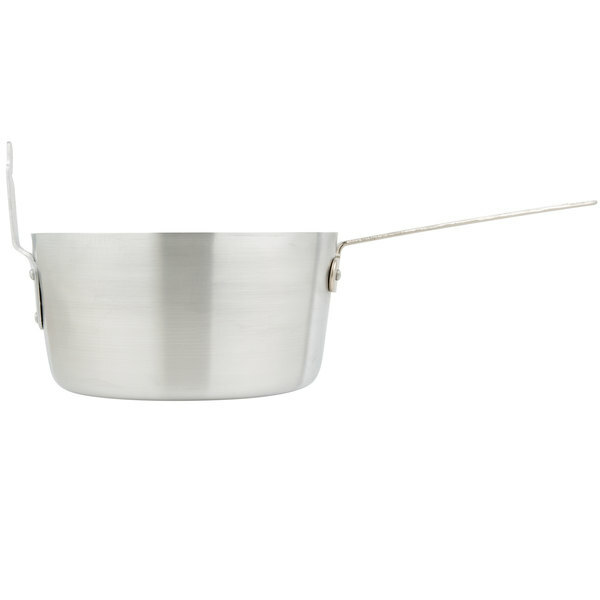 Great for frying up french fries or chicken fingers, this aluminum fryer pot is a great alternative for kitchens wanting to offer fried food without the expense of a deep fryer. 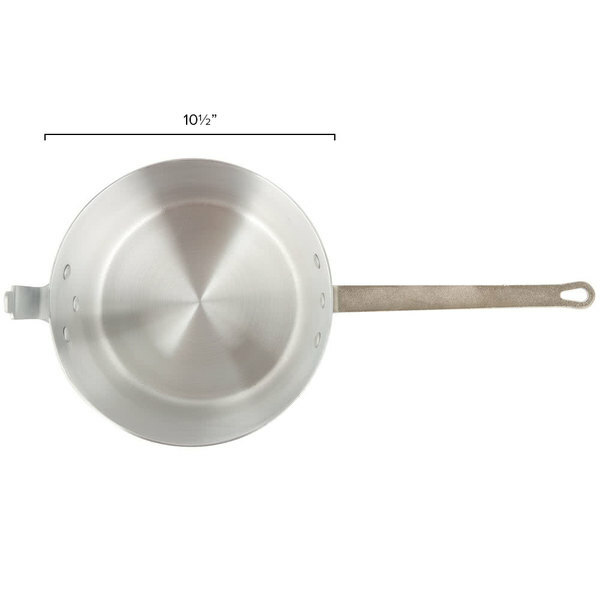 Made from strong, aluminum material, this pot is light weight and conducts heat well, ensuring it will be able to handle the demands of your kitchen. 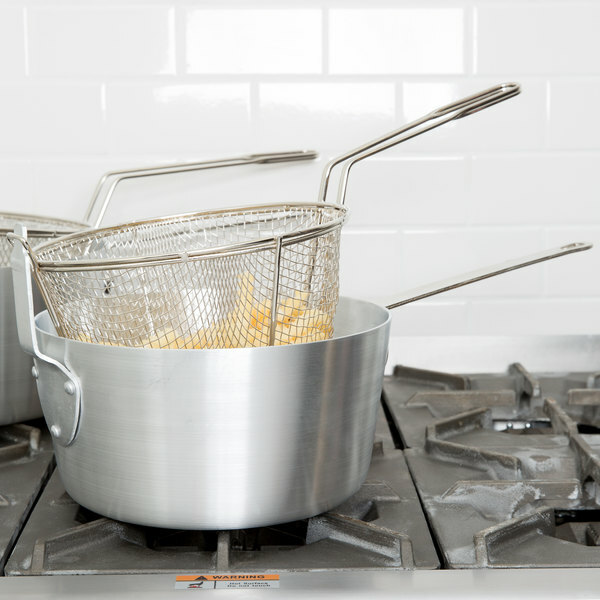 A draining basket (sold separately) can easily be attached to this fryer pot's heavy-duty chrome steel hook, which helps keep it secure while using the pot. 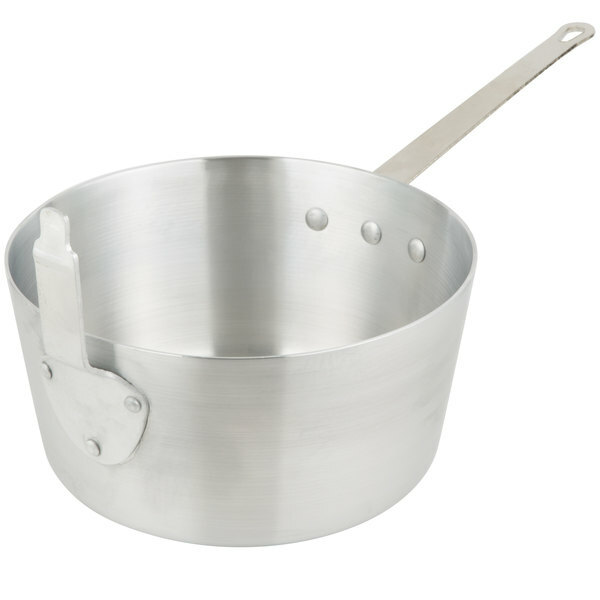 Plus, the pot's riveted handle is sturdier than handles that are welded together. It won't need tightened and it endures heat well during use. This is a good quality pot for a low price. It heats evenly and food doesn't stick to the bottom easily. It is very easy to clean. I would purchase this again. love using this product when making mash potatoes because it so big i dont have to worry about using another pot, i can just use the same one. This was a great addition to my home. It's very sturdy and it cleans easily in the sink. It is good quality for the price! I would recommend. Great size - heavy weight for frying with even heat. NOT induction friendly! Love the hook to hang a fry basket - really great value! Essential for making real french fries. Nice heavy weight. 7 qt is good size for two servings at one time. If you need to make more get the larger size. This pot is one of the best finds here! We had another deep fryer that we used to make french fries and fried ravioli that immediately got donated to charity once we tried this. So much easier and more useful. The perfect size for home use. Large enough so that you're not having to fry multiple batches to feed a family of six. Oil needed is about 3 quarts to fill halfway. Isn't too large to fit into a ordinary kitchen sink to clean, nor too heavy to deal with when your oil has cooled. Good purchase. I purchased this 7 quart fry pot to fry potato chips and similar foods. The 9 1/2 inch round fry basket fits the pot well. It heats quickly, and the handle holds the basket firmly enough for my needs. What a sweet pot! It will make stove top frying much easier! Great alternative to breaking out the table top fryer at home!! Use a deep fry thermometer for precise frying!!! VERY NICE, FUNCTIONAL SIZE, WORKED WILL couple of things, but not sure if my stove or design, but very few times have I experienced the pan "dragging..tugging" hard as I try to move it off the burner when done. The handle could be more comfortable and when you align the peg of the pot to the basket loop to hold and drain it is a bit ackward fitting... compared to the price it works well even though.. The only problem was it didn't slide across burner well, rough bottom exterior.